From eternity past, God the Father, Son, and Holy Spirit have enjoyed a perfect community of love and relationship. Out of great kindness and generosity, the Triune God chose to share that love by fashioning together human beings, breathing the Spirit of life into us. Created in the image of the Divine, you and I were invited in to bring great glory to the Creator by enjoying relationship with Him and joining in the work of managing the earth. But in a tragic turn, we decided to distrust the intentions and authority of God. Filled with a thirst for our own autonomy and authority, we wanted a taste of God’s power. In turning away from Him, we separated ourselves from God’s community of goodness, love and perfect relationship we were made to thrive within. Turning our backs on God, we walked into the painful and chaotic world of sin, death and broken relationship. But God would not give up on His most prized creation. So Jesus stepped into human skin and became like us. As fully human, Jesus was filled with God the Spirit and fully relied on the Spirit for life, love, energy, and power to fight temptation, heal the sick, teach with power, show great mercy, lead with authority, and serve with great humility. Choosing to carry the cross as a substitute, Jesus took the punishment for our treason upon His own shoulders, allowing sin and Satan to appear triumphant. But to display His power over sin, Satan, and death, the Spirit of God filled Jesus’ lungs with breath and brought Him back to life, making a new way to be human for those who follow in the death and resurrection of Jesus. Then before ascending back up into Heaven next to His Father, Jesus tells His closest friends they will be able to do “even greater things than He did” because when He goes up He’s going to send down the greatest gift of all – the same Holy Spirit who filled Him, empowered Him, and raised Him from the dead. This same Spirit of God would now fill us and give each of us different supernatural abilities that Jesus Himself used to serve, love and influence people while He was physically on earth. Jesus even elevates it a step higher and says, “I tell you the truth. It is to your advantage that I go away; for if I do not away, the Helper (Holy Spirit) will not come to you; but if I depart, I will send Him to you (John 16:7).” Jesus tells His disciples that they would be better off if He went up and the Spirit came down – even better to have the Spirit within than Jesus beside. So now together as the church, the body of Christ, we function as the visible representation of the invisible God as we each use our gifts to lead, teach, serve, heal, and encourage for the maturity and mission of the church! 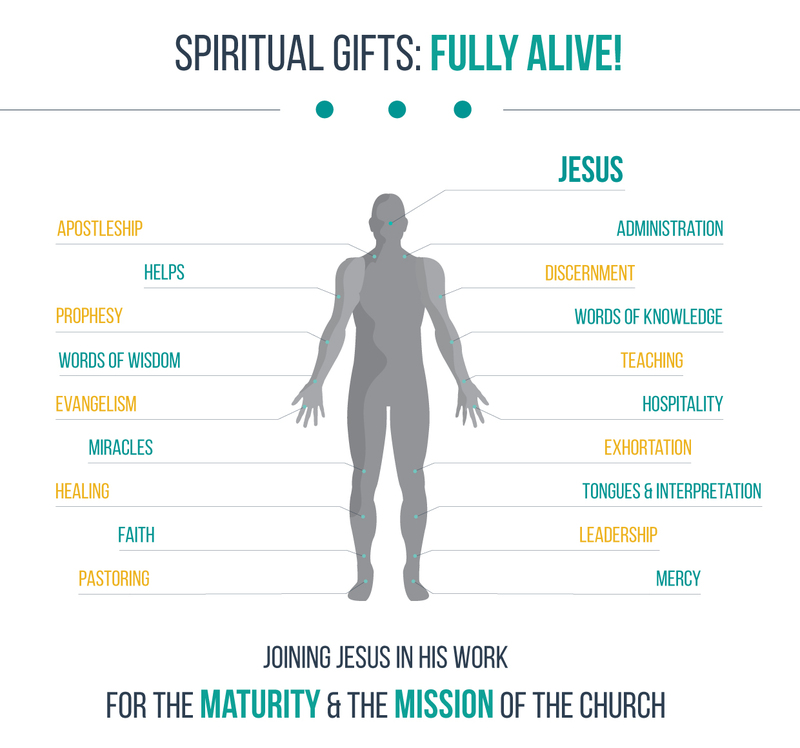 This is what spiritual gifts are – they are“Spirit-given and driven abilities to join Jesus in His work.” Now as disciples of Jesus, we have the great responsibility and privilege of discovering and developing our gifts for the maturity and the mission of the church. Administration “The Chess Player” (1 Cor. 12:28) – The Spirit-given and driven ability to join Jesus in His work by helping provide clear direction and effectively organize resources and people in order to efficiently reach goals within the organization. Apostleship “The Entrepreneur” (Eph. 4:11; 1 Cor. 12:28) – The Spirit-given and driven ability to join Jesus in His work by launching and leading new opportunities, businesses, movements, and ministries for the advancement of the gospel. Discernment “The K9” (1 Cor. 12:10) – The Spirit-given and driven ability to join Jesus in His work by quickly and decisively recognizing the difference between truth and error, and right and wrong motives in a message, person, event, or circumstance. Evangelism “The Seed Sower” (Eph. 4:11) – The Spirit-given and driven ability to join Jesus in His work by sharing the love and good news of Christ with others in a compelling way that effectively draws them to respond by receiving God’s free gift of eternal life. Exhortation “The Coach” (Rom. 12:8) – The Spirit-given and driven ability to join Jesus in His work by motivating, challenging, comforting, and counseling others to help mature and strengthen them in their walk with Christ. Faith “The Biggest Fan” (1 Cor. 12:9) – The Spirit-given and driven ability to join Jesus in His work by trusting and acting on the strong belief that God is who He says He is and will do what He’s promised to do and He will not fail in His promises. Giving “The Investor” (Rom. 12:8) – The Spirit-given and driven ability to join Jesus in His work by generously funding, supporting, and investing in people with needs as well as projects with potential. Healing “The Conduit” (1 Cor. 12:9,28,30) – The Spirit-given and driven ability to join Jesus in His work by acting as a mediator in faith and prayer to help reverse the destructive damage of sin through the healing of physical, mental, emotional and spiritual sickness to bring both comfort and health to those who are suffering. Helps & Service “The Utility Player” (Rom. 12:7; 1 Cor. 12:28) – The Spirit-given and driven ability to join Jesus in His work by demonstrating love and support through the meeting of practical needs that help free others to succeed in what they do best. Hospitality “The Team Mom” (1 Pt. 4:9) – The Spirit-given and driven ability to join Jesus in His work by providing others with a warm and welcoming environment for the purpose of relationship in places like your home, work place, or church building. Leadership “The Captain” (Rom. 12:8; 1 Cor. 12:28) – The Spirit-given and driven ability to join Jesus in His work by seeing what needs to be done, setting goals, gathering people, casting vision, and then directing and motivating people to work together toward accomplishing a common goal. Mercy “The Military Nurse” (Rom. 12:8) – The Spirit-given and driven ability to join Jesus in His work by identifying with and showing care, kindness, and comfort toward those who are suffering physically, emotionally, spiritually, or relationally. Their actions are characterized by love, care, empathy, compassion, and kindness toward others. Miracles “The Signpost” (1 Cor. 12:10, 28) – The Spirit-given and driven ability to join Jesus in His work by serving as an instrument or channel through which God demonstrates supernatural acts of power that bring credibility to God and the truth of His message. Pastoring “The Shepherd” (Eph. 4:11) – The Spirit-given and driven ability to join Jesus in His work by leading, guiding, feeding, protecting, and caring for the needs of others in way that is both tough and tender loving. Prophecy “The Plumb line” (12:6; 1 Cor. 12:10, 28-29) – The Spirit-given and driven ability to join Jesus in His work by accurately determining the depths of God’s truth and then sharing it with strong conviction in a timely and culturally sensitive fashion to comfort, encourage, guide, warn, or reveal sin in a way that leads to repentance and spiritual growth. Teaching “The Tour Guide” (Rom. 12:7; 1 Cor. 12:28-29; Eph. 4:11) – The Spirit-given and driven ability to join Jesus in His work by studying, understanding and clearly communicating biblical truth in a way that is applicable, relevant, and challenging so that others grow in understanding and depth. Tongues “The Tuner” (I Corinthians 12:10, 28, 30; 14:1-40) – The Spirit-given and driven ability to join Jesus in His work by witnessing, praying, or sharing in the Heavenly language of God and the angels. Three expressions: 1. Missionary language 2. Prayer language 3. Hearing God say something in the Heavenly language for the strengthening of the church family. Tongues Interpretation “The Translator” (1 Cor. 12:10, 14:13, 26-28) – The Spirit-given and driven ability to join Jesus in His work by understanding, at a specific time, God’s message when spoken by another using the Heavenly language and then translating it into a known language. Word of Knowledge “The Gold Miner” (1 Cor. 12:8) – The Spirit-given and driven ability to join Jesus in His work by possessing sharp insight and perception to speak complex truths with simplicity and great impact. Two expressions: 1. Love for studying and researching a diversity of information and making it easily accessible and understandable for others 2. A momentary impression or picture of helpful insight that could not have been known without the Spirit’s “dropping” it into your mind. Word of Wisdom “The Counselor” (1 Cor. 12:8) – The Spirit-given and driven ability to join Jesus in His work by taking the principles of God’s word and practically applying them to everyday life situations, circumstances, and decisions in a timely, helpful way. Wise people have a worldview that allows them to perceive the patterns of how the Creator has designed this life to be best lived and then they help others find those paths. Difference between the fruits of the Spirit and the spiritual gifts? The fruits of the Spirit (Gal. 5:22-23) point more to the character and maturity of a believer in Jesus, while the gifts are abilities given to individuals by the Spirit for the collective maturity and mission of the church. While individual believers are told to trust the portion of gifts that the Spirit chooses to give them, all believers are called to wholeheartedly pursue maturity in all of the fruits of the Spirit. Every Christian will grow in the maturity of all nine fruits of the Spirit as they pursue a deeper and abiding relationship with Jesus (John 15). Difference between the spiritual gifts and natural abilities or talents? As we will talk about in the series, God loves to use every part of you (personality, passions, experiences, and gifts) to serve, love, and influence others. So the key difference between natural abilities and spiritual gifts is the fact that every human being has been given abilities and talents by God from birth (Psalm 139:13) while spiritual gifts are specially chosen gifts given to only those believe in Jesus and have the Spirit of Christ living within them. In the four key passages that speak to the gifts (Romans 12, 1 Cor. 12, Eph. 4, 1 Pet. 4), there are twenty different gifts listed. During our series, we will focus on defining and describing these twenty specifically. But we believe that these twenty gifts are more exemplary than extensive, meaning there are many more gifts the Spirit chooses to give and use other than the few listed. Does everybody get a gift? Do some get more than others? We believe that every Christian receives at least one primary gift from the Holy Spirit at the moment of conversion. Many Christians are given a primary gift that is the strongest or most dominant and then “wing gifts” that support and complement the primary gift. Romans 12:6 and 1 Corinthians 12:11 tells us that the Spirit chooses the strength, portion, and the amount of influence for each gift with each individual person. Has the Spirit stopped giving some of the gifts? We believe that all the gifts are still active as the Spirit wills and chooses to give them. The Bible is complete and is our only inerrant, trustworthy authority. Therefore, we believe that prophecy and revelation must be tested carefully and needs to line up with the unchanging truth of Scripture. How do you discover your gift? Can I grow and develop my gift(s)? Yes! Paul writes to a young pastor, Timothy and motivates him to, “fan into flame the gift of God, which is in you through the laying on of my hands, for God gave us a spirit not of fear but of power and love and self-control (2 Tim. 1:6-7).” Gifts are like a muscle that the Spirit has given us. Now we have the great responsibility to exercise it, develop it, and use it in a humble and loving way for the benefit of others. We continue to depend on the Spirit’s power to use our gift(s) effectively, but He also gives us the discipline to work at it and develop it for the rest of our lives. 1 Corinthians 14:26-28, 39-40 lays out clear guidelines for speaking in tongues. Paul clearly says that only two or three people should speak and one at a time (v.27), there must be interpretation or the speaker should hold back from speaking out loud (v.28) and there must be control and order, not confusion and chaos (v.33, 40). The abuse in the church in Corinth was that they were claiming that speaking in tongues was a mark of superior spirituality. They were using tongues selfishly and immaturely, thinking that flaunting their gift was a sign of God’s blessing and power on them. But unbelievers who experienced the chaos saw it as a sign that they were out of their mind and just plain weird (1 Cor. 14:23). Paul’s primary point about tongues in the gathering of the church is not to forbid it (1 Cor. 14:39) but to exercise the gift with humility and maturity while carefully using biblical guidelines. They are gifts that edify the church more and bring more benefit to others. The fact that some gifts are greater does not mean others are unimportant or that those having greater gifts are better Christians. Learn more information about joining a team here. Use: Christian maturity is not based on how powerful or amazing your gift is. Christian maturity is measured by how well you use your gift to serve, love, and strengthen those around you. Your gift is not about you. It’s about joining with Jesus in loving others well. Result: God is glorified. The church is strengthened. People are loved. And you are filled with life, joy, and purpose. Motivation: You and I will be held accountable by the Giver of the gifts and then rewarded according to how we managed and invested them for the King and His Kingdom (Matt. 25:14-30; 2 Cor. 5:9-10).